The seat for an elected Vancouver faculty member on the Board of Governors that is currently held by Ayesha Chaudhry will become vacant as of June 30th, 2018. To fill this vacancy, this is a by-election for one (1) eligible faculty member from the Vancouver campus to serve for the remainder of the 2017-2020 triennium, for a term beginning July 1, 2018 and ending on February 29, 2020. 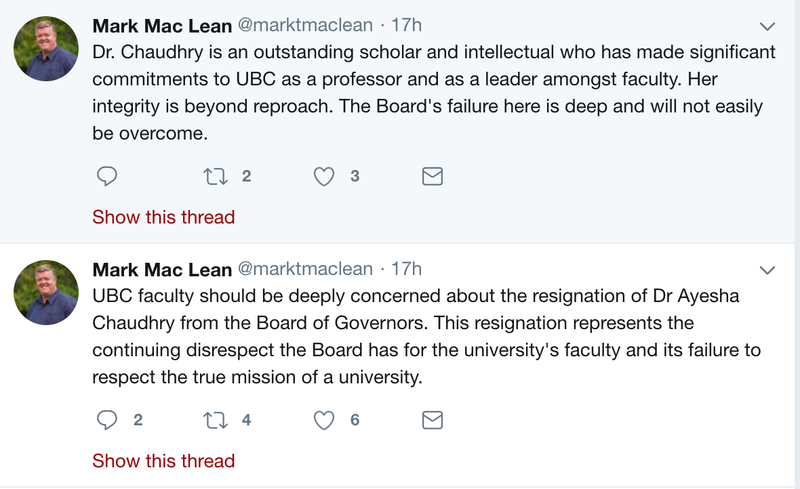 It is a disappointment to lose a scholar and public intellectual like Ayesha Chaudhry from the Board of Governors at UBC. Over the year that I have served with her on the Board at UBC I have found my own understanding of our world broadened. Not a scholar of religious studies or classics I will confess to having been unfamiliar with her research prior to meeting her on the board. What a revelation, what a privilege to get to learn from her through her engagements on the board and through exploring her publications. When the university publicity people talk about excellence at UBC it is colleagues like Dr. Chaudhry who give actual meaning to that often empty term. In the discussion of her departure colleagues have speculated as to why she has left. Dr. Chaudry has pointed to her coming sabbatical as the primary reason for her departure. Sabbaticals of course are not guaranteed. At the start of the year we might apply and not know the answer for some time. Sabbaticals take time and require our focus on research. When we are provided with a sabbatical opportunity it's important we follow up on it and make it productive. In addition, when we take leave for a sabbatical we are supposed to step aside from our various administrative commitments. I can't help but wonder had the Board acted differently might Dr. Chaudhry still be a governor. Dr. Jennifer Berdahl posted a comment to her blog earlier today that compares her own experience on the Presidential Search Committee to what she imagines Chaudhry experienced on the Board. At the heart is the way the current power structures create a sense of futility for those of us intersted in effecting real, meaningful change. 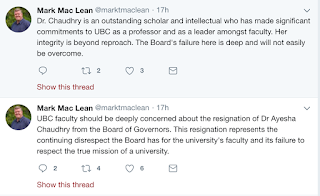 As Berdahl notes: "If Prof. Chaudhry’s experience was anything like mine on the UBC Presidential Search Committee, she quickly realized how alienating it is to be one of only three faculty members on a 21-person corporate-controlled Board. It was likely even worse for Chaudhry as a woman of colour. Combining this with the Board's shenanigans that are designed to manipulate information and process to achieve desired decisions and minimize academic voices, a sense of helpless futility can set in." It is too soon to say whether anything will change with the new board chair, but the experience over the past year (from my perspective) has been fatiguing. For Dr. Chaudhry and myself, who were elected on a platform of change it takes a lot of emotional energy to engage in an environment where what we say is either ignored, dismissed, greeted with an obfuscational answer, or we are explicitly told we are wrong. Reviewing governance, tinkering with procedures and rules of order for meetings, are all well and fine. However, if the cultural practices of racialized discourse, gendered power, and inherent valourization of wealth over intellect remain unchallenged no amount of tinkering with rules and procedures will create a better outcome. If the board is serious about engaging honestly with all faculty (not just those that agree with them) and sincerely wants to create the capacity for real diversity, then they will need to address the cultural practices that fundamentally exclude and demean those of us who are not members of the corporate elite. Teaching Intro: "Am I the one to do it?"